Okay, they are the expensive, chi-chi places to go, but you can hear. Lovely….for romance or to close a business deal. It’s hard not to be annoyed with the Ritz. That it took more than 10 years for them to bring us a quality bar like Avery is maddening.Capitalizing on the lobby-as-cocktail-lounge trend (see: the Liberty, the W), the hotel recently reimagined the space beyond the check-in area, adding a marble-topped bar, several tables, and a long, glowing fireplace. With butter-soft leather chairs beckoning from private nooks and corners, it’s the kind of inviting refuge that the neighborhood has long lacked. Classic cocktails (a Martinez, a Vesper) and reworked ones (a Hemingway daiquiri with pink foam, a sparkling ginger Negroni), ranging from $12 to $16, anchor the drink list. Newly opened, right off the hotel lobby, Avery Bar boasts a sleek and sophisticated design inspired by the classic mid-century modern style of the 1950s. It features a warm palette of colors, textured fabrics and leathers, and unique light fixtures as well as area sisal and wool rugs covering the Italian marble floors. Avery Bar’s main focal point is a 13 seat arch-shaped bar, highlighted by a dramatic chandelier that bathes the space in warm glowing light. Other key features include a distinctive fireplace that has been elevated to eye-level to enhance its dramatic effect and four distinctive seating areas, designed for engaging and socializing, two of which also offer ideal semi-private options. 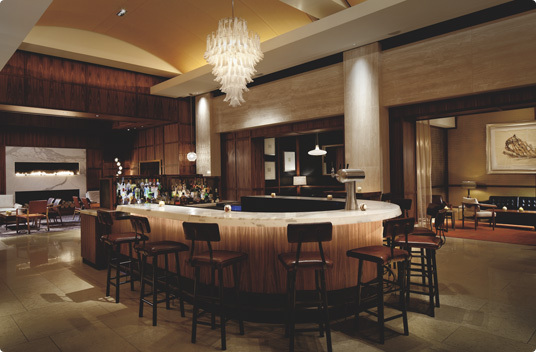 Modern craft cocktails, including ten signature martinis [dubbed “the Avery Ten”] pay homage to the bar’s address at 10 Avery Street. Dry, dirty, sour, sweet, and Russian are just some of the “Avery Ten” showcased on the cocktail menu; along with an impressive wine list, beers on tap and cocktails that call to mind pre-prohibition and early 1950’s classics while boasting their own modern style and taste.